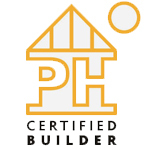 Located just blocks off the plaza in historic downtown Sonoma, PassivWorks has built the first Certified Passive House™ in California and the first Certified Passive House™ retrofit in the United States. Homeowner Catherine O’Neill wanted a comfortable and environmentally-friendly home. Upon learning the advantages of the Passive House Standard, she decided to create a model home and help set a new benchmark for energy efficiency in America. Constructed in 1960, the ranch house was originally two structures linked by an outdoor covered breezeway. The two existing slabs were uninsulated and at different elevations. The single story, North-facing, ‘U’-shape configuration not optimal for solar access or performance and further limited due to shading by adjacent buildings and trees. Site conditions and zoning required that the existing footprint and foundations remain. The retrofit transformed this neighborhood eyesore into a near net zero energy, state of the art modern farmhouse “jewelbox” that provides exceptional comfort and durability with energy bills averaging $15/month. Energy savings and predicted performance are confirmed by the Department of Energy and Lawrence Berkeley National Lab which have installed monitoring equipment in the home.